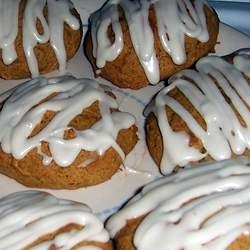 This recipe for pumpkin cookies is something you want to have handy. These homemade pumpkin cookies are spiced perfectly and topped with decadent cinnamon cream cheese frosting; so delicious. When autumn arrives, it just wouldn't be the same without baking pumpkin cookies from scratch. Your kitchen will smell delightful and topped with my dreamy cinnamon frosting - they are to die for. Seriously. So double the recipe because they will not last long. Combine the first five ingredients together and set aside for now. Cream the sugars with the butter until light and fluffy. Add the pumpkin, egg and vanilla. Now mix in the dry ingredients. Drop on a cookie sheet by tablespoons and flatten the top slightly. Bake for 15 to 20 minutes. In a bowl - combine the butter, cream cheese, powdered sugar, cinnamon and vanilla extract. Beat until the frosting is smooth and creamy. Frost the cooled cookies and sprinkle with the nuts.